A special sector of the printing industry is a large format printing needed in design, engineering and reprographics businesses. 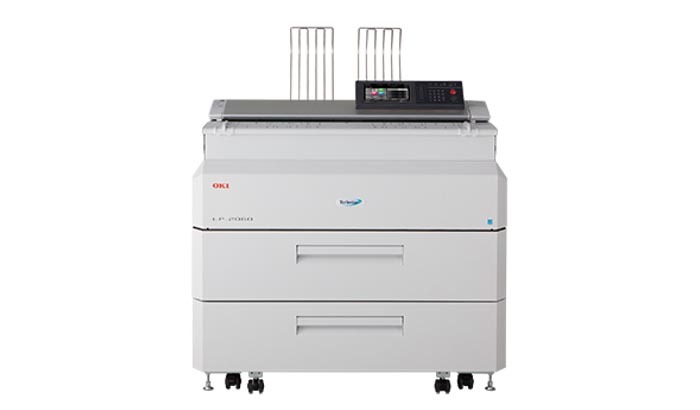 OKI Data Australia as one of the global leaders in producing business printers and multifunction devices has launched a novelty combining of design and technology to enhance productivity of various types of businesses such as print shops, architecture, engineering, construction and print proofing. Its new Teriostar series printers suit small workspaces and help to maximize uptime of a busy office by the employment of the first in the industry user-replaceable process cartridge (which also reduces support costs) and multifunctionality including color and B/W scanning and copying. OKI Teriostar series includes the LP-1040MF and the LP-2060MF digital LED 8.5” color touch-screen MFPs. The gadgets provide best-in-class mono print speeds of 7 and 9 A1-size ppm, respectively, scan speeds of 240 mm/sec, parallel processing of tasks and printing on maximum lengths of 10 m and 15 m, respectively. The new printer models are properly secured from unauthorized use, risk of uncollected output, waste and job logs by PIN code authorization and other advanced functions. The printers of the Teriostar series will be available in September. This entry was posted on Tuesday, August 15th, 2017 at 7:23 am	and is filed under multifunction, OKI. "HP OfficeJet Pro 7720 Wide Format Printer For Small Businesses"
"Toybox 3D Printer For Kids"